My name is Wolfgang Grasst, principle investigator at Washington State Investigators. Years of training and experience in Kwon Moo Hapkido under Grand Master Kim has prepared me to confidently handle a variety of threats proving to be beneficial in the world of private investigation. Working in the field can be dangerous depending on the type of case and subjects you encounter. Two Hapkido skills I primarily focus on are power punching and in close joint manipulation. Kwon Moo means "deadly hands" and what you the audience will notice is the power of our punches and how we quickly move in, staying close to the threat, and using our body to assist when manipulating a joint. Kwon Moo Hapkido is known for it's aggressive counter attack, reducing the threat to a non-combative state. My USN military background (USN-Fighting Seabees), training with Seattle Community Police Academy-Class #40 (2015) and practitioner of Kwon Moo Hapkido since in 1981, are all skills that allow Washington State Investigators to provide professional personal security and bodyguard services. But, this webpage is not about promoting these services, it's purpose is to recognize Kwon Moo Hapkido and how training will prepare you to handle a variety of threats. My goal is to promote and offer training to anyone who wishes to learn Kwon Moo Hapkido preparing you to defend yourself or others in real threat situations. Training is provided by Grand Master Kim and training location is in Burien WA. Classes for personal security and bodyguards, law enforcement and military are also offered as private and group classes. Specialized classes for personnel who provide security and bodyguard services, law enforcement, military, and women's self defense classes. Classes are conducted at the Kwon Moo Hapkido school in Burien or we can hold classes at your location dependent on location and availability. We invite you to contact Grand Master Kim at the Kwon Moo Hapkido school or Wolfgang Grasst at Washington State Investigators about class information or to answer questions about Kwon Moo Hapkido. For more information about Hapkido history, Grand Master Kim and Kwon Moo Hapkido, please continue reading. Hapkido means “The Way of Coordinated Power” and for many years those who provide personal security, bodyguard services, law enforcement and military special ops have regarded Hapkido as one of the most practical, efficient and complete martial arts around. Yet until recently, the vast majority of the general public has limited knowledge about Hapkido. For those who wish to learn this highly effective self defense martial art, Kwon Moo Hapkido offers self defense training designed to provide you with a set of skills and techniques to better control, protect and defend yourself in a threat situation. Hapkido style of martial arts consists of hundreds of different techniques. The wide variety of these techniques can make Hapkido seem like a different martial art from one moment to the next. Its kicking and punching style make it appear like Karate or Tae Kwon Do. Its many throwing techniques cause it to look like Judo. The wrist and joint locks look similar to Aikido. Grappling and escapes appear similar to Jujitsu. However, Korean Hapkido includes all these different techniques in a single art because it is a self defense, personal security, body guard and combat martial art. Hapkido self defense training does not include kata or forms when learning. You learn skills and techniques that work in the street or combative assault situations. Kwon Moo Hapkido focuses on specialized technique, speed and power, and emphasizes circular motion, redirection of force, and control of the opponent. Kwon Moo Hapkido students seek to gain advantage through footwork and body positioning to incorporate the use of leverage, avoiding the use of strength against strength. Understanding the nature of Hapkido requires knowledge of actual combat or self-defense situations. First, in real situations, there are no rules. Second, there is no way to predict the situation an attacker will create. Third, an effective defense requires that your response to aggression must be by reflex and appropriate for the particular attack. Since there are no rules in combat or street fighting, you cannot predict how someone will attack. Kwon Moo Hapkido offers a variety of techniques to deal with and respond appropriately to any type of attack. Kwon Moo Hapkido black belts incorporate the use of weapons, including knife, sword, rope, cane, short stick (Dan Bong), and middle-length staff (Joong Bong) which vary in emphasis depending on your situation. Kwon Moo style of Hapkido is only taught by Grand Master Kim who focuses extra emphasis developing punching power, joint lock techniques, foot sweeps and other skills to stop an attacker quickly. A Kwon Moo Hapkido practitioner will use the appropriate technique to fit many possible forms of attack (hit, kick, grab, etc.). When a Kwon Moo Hapkido practitioner is attacked, his training is to react reflexively (thinking is too slow) to the attacker rather than with predefined techniques/skills. A Kwon Moo Hapkido practitioner not only redirects the attack, but turns it against the attacker and follows through with devastating counter offensive techniques which will control the attackers violence or render the attacker incapable of further antagonistic actions. Obviously, this requires training in a wide variety of Hapkido techniques. However, Kwon Moo Hapkido will equip the new martial artist with techniques allowing them to defend against an attacker in real life street situations. Although no one can learn the full range of Hapkido techniques overnight, the beginning student immediately learns useful and potent fighting techniques. Yellow belt techniques such as back fist, knee kick, joint lock and elbow strikes are frequently used favorites. The defensive grab and break techniques taught along with the low sidekick allow you to control and disable an attacker regardless their size or strength. As you can see, Kwon Moo Hapkido students learn effective techniques right from beginning and throughout their Hapkido career. Grand Master Chae Un Kim has an 8th degree Black Belt in Korean Hapkido and holds black-belts in Tae Kwon Do and Tang Soo Do. 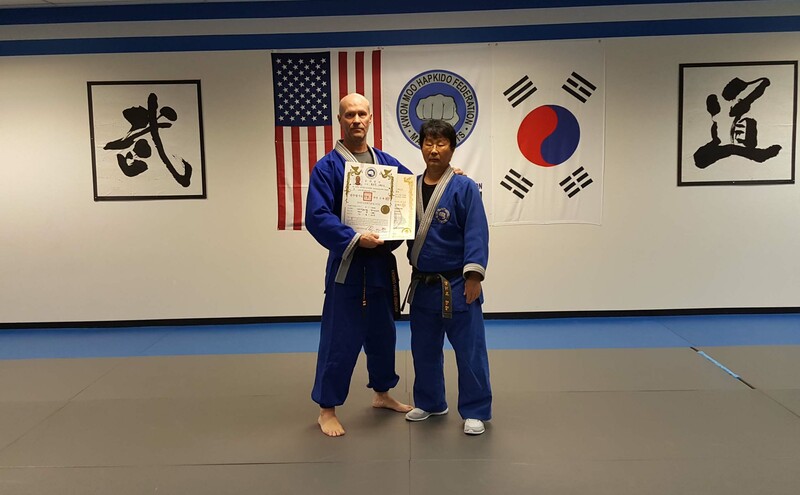 Grand Master Kim's techniques are a blend of traditional Korean Hapkido and Buddhist Monk techniques bringing your whole body in close to counter and manipulate a threats size and strength. Grand Master Kim's goal is to leave a legacy of quality Kwon Moo Hapkido practitioners for generations to come. His dedication is unparalleled with over 50 years teaching and perfecting his technique. Arriving in the US from South Korea in 1980, he took the best techniques from traditional Korean Hapkido and his training with the Buddist Monks to create his own style of Hapkido. Grand Master Kim’s style is so effective, it has been taught to Special Forces in South Korea and the United states as well as military police and S.W.A.T. Master Kim has created a family friendly refuge for adults and kids to dedicate themselves in the art of Kwon Moo Hapkido. As students learn Kwon Moo Hapkido, they begin to gain confidence in their self defense ability when facing a threat. Grand Master Kim is going to teach you how to end a fight as quickly as possible with specialized techniques for any size threat. Grand Master Chae Un Kim founded the Kwon Moo Hapkido Federation and has over 50 years of experience practicing Hapkido. During his lifetime Grand Master Kim has dedicated himself to refining and developing the most effective and simple Hapkido techniques to end a threat quickly. This gave birth to his own refined style of Kwon Moo Hapkido (meaning "deadly hands") as mentioned above. Grand Master Kim practices and teaches his signature techniques using full body power which sets Kwon Moo Hapkido apart from traditional Korean Hapkido. What you will learn from the Kwon Moo Hapkido Federation is aggressive counter attack techniques addressing a wide variety of physical threats you may encounter. Most forms of martial arts that promote “self defense” only focus on a limited specific range of fighting techniques such as kicking, punching or twisting, but the Kwon Moo Hapkido Federation realizes this limitation and trains students with a variety of self defense techniques that work against an attacker in the streets. To be a true school of self defense, you must be prepared to counter and respond to many forms of attack. This includes: weapons, kicks, punches, grabs, chokes, throws and being taken to the ground. One of the most important things a person should learn is to be situation-ally aware of your surroundings. Characteristics of Kwon Moo Hapkido that someone new notice is the aggressive counter offensive attack. Hapkido practitioners do not initiate a fight and don't typically make first contact, but let the attacker make the mistake by initiating an attack and then finish the fight quickly with an aggressive counter offensive attack. Some characteristics of Kwon Moo Hapkido include: the focus of basic knock out power punch, front/lead leg kicks, pressure points, joint locks (joint brakes, A.K.A. “Twisting”) and take downs. We believe in the “ONE MOVE and OUT” principle rendering the threat unable to retaliate. Kwon Moo Hapkido Martial Art School is located in Burien, WA. We provide day and evening classes for adults and children. We offer private training sessions, women's defense classes, and we offer specialized training for bodyguards, personal security, and law enforcement. Group training at your location or place of business is also available. To learn more about class schedules and training offered, we invite you to contact us at Kwon Moo Hapkido or come in to the school and watch one of our classes. If you feel a little motivated, please bring something to sweat in and workout with us, which is the ultimate in gaining greater insight about Kwon Moo Hapkido. We are located at 15811 Ambaum Blvd SW Suite 120, Burien, WA. 98166. To reach us during school hours, please call (206) 466-2627 or contact Washington State Investigators for more information. For more information: Location Map, Directions, or Contact Kwon Moo Hapkido for more program details.